A middle aged man, Paul Nonso Nzedebe, over the weekend, caused a disturbing stir and took domestic violence to another level when he beat up his wife and mother of his three-months-old son, Nwogo, and in the process, used a plier to cut off one of her ears. It was gathered from close friends that the marriage which was celebrated with a lot of fanfare, had been experiencing hiccups as Nzedebe turned his wife into his punching bag, beating her at will. The last straw was when he allegedly beat her up over a minor quarrel and she reported him to the police. He was invited, interrogated and told to go home and make peace with his wife but when he got home, he descended on her and in the process, cut off her ear. 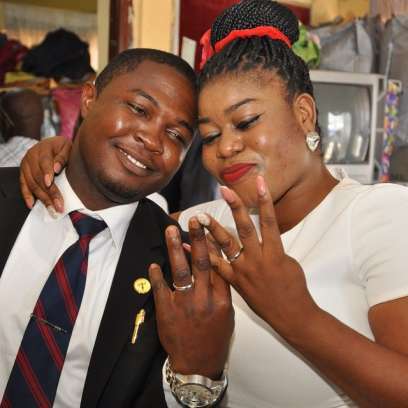 But another twist has been added to the case as one of Nzedebe's close friends took to Facebook to state that Nwogo had been abusive, slapping and hitting her husband whenever they had any issue, based on the fact that she is from a rich home and her family sponsored their wedding. "I am close to the family and I can say that though I am not in support of what Paul did, Nwogo on her part is not the angel many are painting her. Her family has a little money and that has made her haughty. They actually sponsored their marriage and after the wedding, her mother seized all the money they were sprayed, claiming that he did not contribute a dime to the wedding. Then the girl's family disrespects and abuse him, and Nwogo slaps her husband whenever they had issues. The girl slaps him anytime they have a disagreement, the girl destroyed their materials/furniture when they had an argument. Anyways, from fighting one of these days.. he used pliers and screwed out her ear," the friend said. But no matter the provocation, a real man needs not raise his fingers on a woman!